It’s always been somewhat paradoxical how damaging water can be. Water, after all, is the essence of life. It is responsible for all natural growth in the world, and humans will die within days without its sustenance. And yet, water also has a nasty habit of wreaking absolute havoc when it wants to. Floods and destroy entire communities, while minor leaks and puddles can ruin entire areas of your home. Water truly can be a nuisance, and that’s why if you see signs of water damage in your home, it’s important to act immediately. However, not everyone knows the telltale signs of water damage in their home. As a professional water and flood restoration company serving clientele all over Massachusetts, we’ll help you to know how to identify water problems in your home. Let’s take a look at signs of water damage, and what you can do about it. The first and most obvious sign of water damage in your home is when your ceiling or drywall starts to look discolored. In most instances, it’s not a gradual blend — it has a defined shape which is usually representative of how the water is moving. 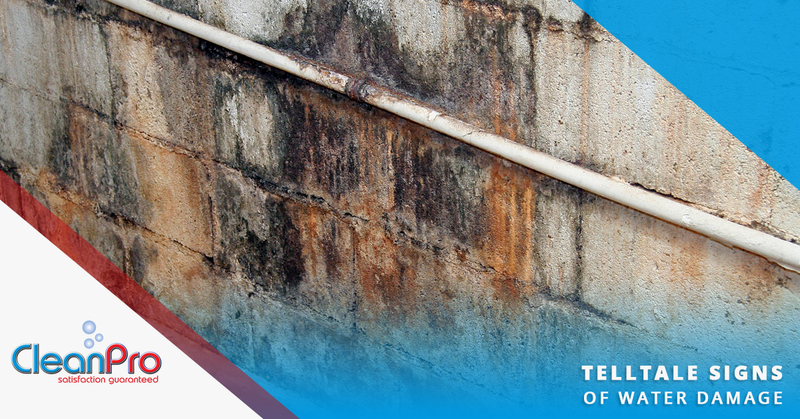 Continual leaks or pooling water might result in a circle or “blob” shaped stain on your wall. Or, if the water is somehow flowing like a stream through your ceiling or wall, you might see streaks. Water stains usually convert white surfaces into a light yellow color, and gradually shift to a more brown darker color as the problem gets worse. But even if you don’t have white walls or ceilings, it shouldn’t be hard to spot that’s being affected by water damage somewhere. Water and paint don’t play well together, so when you have a painted surface of your home that’s suffering from water damage behind the scenes, you’ll likely start to see the texture of the paint change. This is usually manifested by cracking and peeling. The water breaks down the wall and makes it softer, causing the paint to start breaking apart. If you see your paint starting to deviate from the norm, it’s not happening for no reason — something is amiss behind those walls and it needs investigation. This is typically concurrent with the colored stains that come from water damage, but not always. So even if there’s no discoloration or stain to reveal water damage, you might find that the wall, ceiling, or floor is starting to warp and bubble up. If you touch an area that’s being affected by water damage, it should be softer than the rest of the wall. In any case, it’s a pretty clear sign that it’s time to call your nearby water damage restoration company to take a look. Water has a unique effect on every surface it touches. While some materials tend to bubble, you might also find that your floor has spots where it’s sagging or sinking. The effect will be subtle, but you’ll be able to tell if you take a close look, or walk over the spot yourself. It’s possible for your wooden floorboards to soak up any water that’s leaking, which in turn makes it weak and can even make it go rotten. Weak and rotten wood is predictably weaker than the solid floorboards you originally paid for, and you’ll find that it stops doing its job as a reliable floor once this starts to happen. Another lovely effect that water has on your floors is that it might cause tiles to loosen up, or floorboards to warp. Wooden floorboards can sink, like we mentioned in the point above, but they can also “buckle,” trying to curl up as much as they’re able. Additionally, once the floorboards have been fully dried, they never quite return to normal, and they might even shrink in size. This causes annoying gaps in your floorboard, which often require total floorboard replacement. This is why it’s necessary to identify and stamp out water damage as soon as possible! It’s hard to describe the scent of mold, but you’ll know it when you smell it. Even if you don’t know for sure that it’s mold, it’s usually pretty easy to tell if the thing you’re smelling is related to water. Everyone has smelt the scent of mildew before, so whether it’s that or mold, it is, at the very least, a sign that something is wrong. In The Lord of the Rings, Gandalf said, “always follow your nose.” We can’t think of better advice for seeking out water damage. Sometimes, there’s water damage happening in your walls, floor, and ceiling, but it’s not quite big enough to show any obvious signs in your home. But if it’s left there for a long time, water will do what it does best and spawn life, leading to mold growth, which is a health hazard unto itself. Leaky pipes are one of the most insidious instigators of water damage, and often the type that is hardest to identify. A leaky pipe can happen anywhere in your home, whether it’s right at the base of your washing machine, or deep inside your walls. If you see water damage accumulating somewhere that doesn’t make logical sense, it’s a likely sign that your pipes have become damaged in some kind of way. Leaky pipes can cause different types of water damages due to the different forms a leak can take. A minor leak could cause nothing more than a slow, yet constant drip which runs down your pipe and eventually falls onto the surface below, which could very well be the ceiling of another room. Or, it could be a more serious breach where water sprays out like a garden hose. If this is spewing all over the adjacent wall, you’re likely to see a puddle-shaped discoloration. Water can also find its way into your home if your exterior isn’t properly sealed. We’re being a little vague here, because we could spend a lot of time detailing every possible instance where this could occur. But, for example, damage to your roof could result in tiny openings that water can slip through into your home. It’s also possible for your foundation to not be totally watertight. Homes are designed to prevent water from pooling around them, but damages to sewer pipes and floods can cause the ground to become soaked. You can bet water will find its way inside if it does, which would result in basement flooding. If you’ve spotted one of these signs of water damage, it’s time to take action. Water damage can only ever get worse, and the longer you wait, the more you’ll end up paying out of pocket to fix the problem. Water can severely weaken structures over time and destroy property if it ends up culminating into a flood. We perform extensive water and flood damage restoration at CleanPro, and we also offer handyman services which can help with plumping and pipe damage. We’ve helped countless Massachusetts clients to take care of their water damage. If you’re in Gloucester, North Shore, or the surrounding areas, contact us today for a free quote.